Lyon and Paris: Librairie Catholique de Perisse Frères, 1844. Small octavo. viii, 524, (v) pp. A seventeenth-century silver gilt, jeweled binding covering a French prayer book, which was placed into the binding at a later date. Very fine in a modern, velvet-lined dropback box. The Journée du Chrétien concerned the daily duties of Christians, including devotional prayers to saints and angels, and was similar in construction and function to a Book of Hours. This copy is exquisitely presented in a seventeenth-century jewel-encrusted binding, both covers of which bear a filigree ornament in all four corners as well as, at the top, a crucifix in which Adam's skull appears at the feet of Christ to symbolize the cleansing of Adam's sin through Christ's blood. 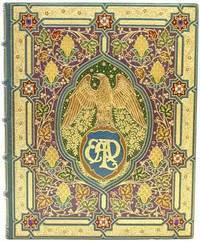 In the center of each cover is the imperial double eagle of the Holy Roman Empire, and below is a pair of hands clasping a heart. 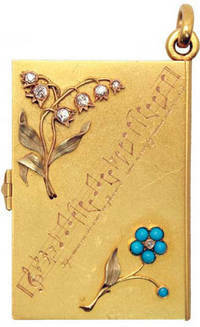 Both of the covers and the spine are decorated with dozens of semiprecious stones including amethysts, garnets, simulated sapphires, and turquoise; the clasps are encrusted with similar jewels, as are the elongated head- and tailbands. The paste-downs are red velvet, endleaves blue silk. This is a truly remarkable binding of uncommon beauty, with all the stones present and firmly set, and only minor wear to the gilt. 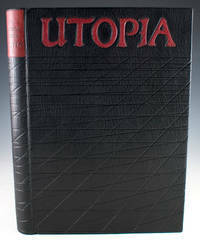 The book previously had been in the Hohenzollern collection exhibited at Frankfurt's Städel Museum in 1928, and more recently was owned by Cornelius Hauck, who had acquired it from the famed German bookseller Emil Offenbacher in the mid-1950s. The inside of the front endpaper bears Hauck's bookplate, and the stamp of "Stadtbibliothek" appears on the verso of the title page.